YOU might have seen Sister Norma Pimentel around. Hoping to talk with President Donald Trump when he made his Texas-Mexico border visit in January; speaking at the United Nations; testifying before Congress; being part of an international satellite broadcast in 2015 with Pope Francis just before his US visit. She has won a number of awards, including the University of Notre Dame’s prestigious Laetare Medal, Catholic Charities USA’s Keep the Dream Alive award and the Sr Margaret Cafferty Development of Peoples Award from the Campaign for Human Development, presented during the Catholic Social Ministry Gathering in Washington. “My prayer life, it’s key for who I am today and what I do,” Sr Pimentel, a member of the Missionaries of Jesus, said. Sr Pimentel’s ministry does not seem all that complicated, until you look at the scale. Since her immigrant ministry began in 2014, she estimates she has met 125,000 immigrants at the bus stop in McAllen, Texas, taken them to a shelter where they can get a shower, toiletries, some food and a respite for a couple of hours – until it’s back to the bus station for the next leg of a highly uncertain journey. “I hired someone to follow up on how they are doing,” Sr Pimentel said. “Some have been deported, some do not have that phone number (anymore). Not only are Latin American immigrants arriving in McAllen in big numbers, so too are the American immigrants making their way to south Texas to assist in Sr Pimentel’s ministry however they can. “For me, when I see people that come from different parts of the United States to volunteer, pretty much to learn and see what’s happening and to be part of that response, they’re 100 per cent self-giving to be there to help the immigrants,” Sr Pimentel said, holding out special praise for the many retired religious sisters who come in pairs and stay for two weeks to help. “You see in their faces, the joy of helping, the joy of being able to care for the families, whether it’s cleaning a toilet, washing the towels, making sandwiches. “You see in them ‘con gusto,’ with great … happiness. “They’re not getting paid, they’re doing it out of their own enthusiasm to do something good. You see it in their faces. “Their engagement and their involvement becomes so alive and you know that God is present in their life. “That comes from a sense of awareness of God in them through that expression in them of what they’re doing. That “rostro” is not always evident in the faces of the immigrants Sr Pimentel and her crew are helping. Despite that, she said there had never been a violent incident in her ministry. 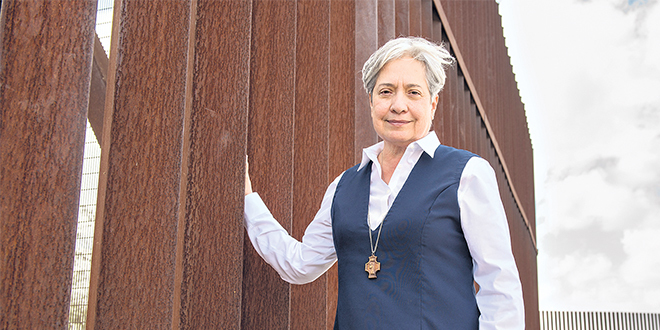 Because she is so closely identified with her immigrant ministry, one has to remember that at the same time Sr Pimentel is executive director of Catholic Charities of the Rio Grande Valley in the Diocese of Brownsville, Texas. She reviews grant proposals she used to write herself. “We have very poor people. Yet within the poverty of the families, they share what little they have with those who have less. One of the things that our people in the Rio Grande Valley is that there are people who are very generous,” Sr Pimentel said. “We run out of – for example, ‘Sister, we are out of deodorants and combs’. We have so many followers on Facebook. I have to put it (to Facebook), because if somebody else does it, they don’t get as many (responses),” Sr Pimentel said. “Sometimes,” she said, “I have said I have to tell them to stop sending it. “We needed baby bottles. Now we have a whole room of baby bottles.